Do you find yourself tapping on your desk throughout the workday? Or maybe playing along to music on your car’s steering wheel while stuck in traffic? It’s time to put rhythm to work for you and your team, and Bang On My Drum All Day is the place to hit it! Minimal instruction is needed before your group is off and drumming with drums, shakers, and bells in a Drum Circle. A Drum Circle is more than just a physical circle. It is a community, a team, and a powerful analogy for the workplace – every individual's part is unique yet crucial to completing a common team goal. Have fun with our ‘office percussion’ activity in which you create a rhythmic song using everyday office supplies. Bang On My Drum All Day provides a fun, safe, and supportive atmosphere for everyone to experience creating rhythm together, and for each individual to discover the rhythm that they already have within. 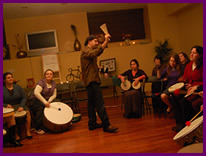 With his personable teaching style, Adam Issadore and his team from Path to Rhythm guides the group through activities that allow them to play and realize their fullest potential. Find your team rhythm and head back to work as one cohesive, energized, rhythmic unit. Bang on My Drum All Day leaves participants feeling energized, with a new perspective on rhythm and playing and working together. We donate a portion of our fee to drumSTRONG™ , the planet's longest continuous rhythm drum-a-thon beating cancer. drumSTRONG™ is an event that encourages people of all ages to focus attention on cancer awareness, education, support and funding for cancer concerns. One-half of the funds raised by drumSTRONG™ benefit the Levine Children’s Hospital - Hematology/Oncology Center at Carolinas Medical Center. The other half goes to the Lance Armstrong Foundation. We emphasize using recycled materials to drum with. Please reduce, re-use and recycle daily. This program can include a debrief by a trained facilitator focusing on new discoveries about your team, and celebration of successes. The debrief can be customized for your group goals. 60-120 minutes, 90 minutes average. This program is also available as part of a one-day workshop including a range of fun and stimulating team-building exercises. Enough space for people to be sitting, ideally in a circle. Larger groups may form multiple circles.